Here is the light that sits at our number 1 spot in our top 10 best outdoor solar lights guide. The Solatec outdoor solar light is a beast. Holding at 4.8 stars on Amazon, along with the badge for #1 New Release in Landscape Path Lights as well as recommended by Amazon. Let's get it on. The Solatec outdoor solar light pretty big. It sizes in at 12.5 x 4.6 x 2.3 inches. the length is just over a foot. So yeah, its bit. But that is because there is just so much inside that it needs to fit in. This lighting fixture features 90 LEDs. 90! We have seen 4, 8, 16, 20, even 30, But never before have we seen 90. The Solatec outdoor solar light has 80 LEDs facing downwards, with 5 more on each side lighting outwards. One downside is that the company does not provide any information regarding the lumen output of these 90 LEDs. However, there have been no customer complaints about the brightness, and if it follows the style of other high end solar lights of this style, there should be no problem with the lumen output. In fact, one customer reported that their light was able to illuminate a 30 square foot area, or more. To support these 90 super bright LEDs, the fixture includes a lithium-ion rechargeable battery with a capacity of 3400mAh. Again, the largest battery we have seen in the fixtures we have featured. And it seems to do a great job. With just 7 hours of charge, the battery can last up to 12 hours at it's highest light setting. That is just plain crazy. Speaking about charge, the Solatec outdoor light features a solar panel with a 17% conversion rate. While 17% is very standard for outdoor solar lights, it is still very capable. Unfortunately, no information was provided about the type of solar cell that is included. But we can speculate that with the quality of the rest of the technology we are seeing, it would be the same. Most likely, it is a PET polycrystalline solar cell. However, without the actual quoted information, that is just speculation. Nevertheless, there have been little to no customer complaints about the solar panel, so there should be no issue. The body material is another piece of information that was not mentioned. However, they did provide information about the weather protection it has featured. It has a waterproof rating of IP65, again higher than the standard, and it is also heat-proof. Customers have also reported that it feels very sturdy. While I am sure none of them have purposefully dropped theirs on the ground, surely it could withstand a fall. 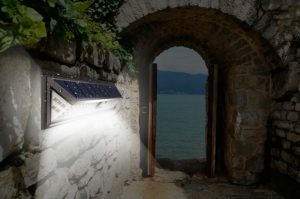 Overall, the Solatec outdoor solar light should be able to handle whatever weather that comes its way, with ease. The features are where this fixture continues its awesome streak. This guy has all three lighting modes that we all love. Full bright, dim with bright with motion, and just motion brightness. This way, you can use it for really whatever you want. Security lighting, guide lights, door lights, garage door lights. Whatever your needs, this thing can handle it. The motion sensor is yet another feature that goes above and beyond. It can sense motion up to 26 feet, which is pretty far. Pair that with the standard 120 degree sensing angle, you are pretty much good to go. Once motion is sensed, the bright light will come on for 10 seconds and then turn off automatically. There is literally no information found about this company. There are various Solatec websites, but none of them are the manufacturer of this device. The only other Solatec product sold on Amazon is a solar powered bird bath, which is rated 4.6 our of 5. So it seems that Solatec is a pretty great brand, just wish there was more information available about them. The Solatec outdoor solar light features 90 LEDs. While there was no quoted lumen output by the company, customers have all reported that they are super bright. Due to the design, the lighting fixture can easily light up a 30 square foot area or more. 80 LEDs facing downwards, with 5 on each side facing outwards. The battery capacity is larger than we have ever seen in an outdoor solar light. 3400mAh is plenty to power the 90 LEDs for the entire night at their highest lighting setting. The 17% solar conversion rate is standard but capable. There have been no complaints about the solar capabilities. The fixture is totally weatherproof. It has a waterproof rating of IP65, and is also heatproof. The sturdy design also makes it resistant to drop damage. The motion sensor is better than average. It can sense motion up to 26 feet away, along with the standard 120 degree sensing angle. Perfect for placing over a garage for extra light. Some specifics about the LEDs and the solar cells would have been nice. Otherwise, customers are forced to either speculate about what technology is included or trust the user reviews. None compare to having the specs available for reference. There is no information available about the manufacturer, which can be a bit unnerving. However, Amazon does recommend the product and it does have a #1 badge with a great rating. The Solatec outdoor solar light is bigger than normal. But with a 3400mAh battery and 90 LEDs, you can't really expect it to fit in your pocket. Whatever you want to use this thing for, it has got your back. It can be bright and last all night long. Need a dim to bright setting, look no further. How about some added security, here you go. With that 3400mAh battery capacity and 90 LEDs with their large range of illumination, this may be the only solar light you'll ever need. There is a reason that the Solatec outdoor solar light sits comfortably at our #1 position. It is truly a beast. Missing information aside, the performance of this lighting fixture is just plain awesome. Not to mention fairly cheap. You can pick one up on Amazon for $28.99. For more information, visit Green and Growing for all of your ecological needs. Here are some top questions that I found for people seriously considering buying the Solatec outdoor solar light. What color is the light? It emits a cool white light. How can you switch between lighting settings? There is a switch on the back. Just slide to one of the three icons. How do I install this? There are screws included. Just insert the screws through the holes at the top of the fixture and into the wall.